Supporting weight, turning head, rolling over on his own, and pivoting are all typical gross motor behaviors for a child 6 months old. These actions are shown in addition to atypical motor movements at this age to allow you to clearly see the differences in baby’s motor development. For all the milestones your baby should be reaching, visit our all developmental milestones page. 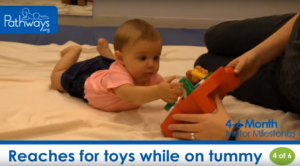 Find tips, videos, and more on our Tummy Time page. Watch what motor milestone look like at 4-6 months. Do you know what sensory milestones should look like? Watch this and compare to your baby.